I get really excited when people I know start to like the nerdy things that I do. It's like I'm welcoming them to all of the references on Tumblr. "You will finally understand so many more things on the internet!" Me: If only he would have carried balloons with him for that episode! 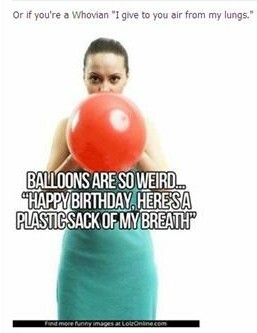 Then it would have been a gift rather than just breathing on them. Who wouldn't want to be a part of this mysterious group? Strange things like this is also part of the reason we are such good friends.